There are so many magnificent plants and flowers available to include in a landscape, garden or patio design, that it becomes a challenge to find ways to incorporate all of your favorites. If an outdoor space consists of a patio area or a small front or back yard, there are decorative options available that will increase the opportunity to create a spectacular display of plants and flowers. A wrought iron hanging basket stand is one of those options. These are available in a variety of attractive designs. The stand itself can become a decorative part of a patio or lawn design. This is especially true when the stand is designed as a replica of a bicycle, tricycle, chair or tea cart. Tiered plant stands or stands with multiple shelves provide an opportunity to display more flowers in a compact space. The use of vertical space is a good design concept in any small area. Tiered plant stands can also be used in a spacious garden area or in a large landscape design. Large areas lack the intimacy and coziness that a small garden space has. Plant stands can be incorporated into the design as a way to create small, intimate spaces within the large landscape design. Surrounding a wrought iron bench with decorative plant stands will create a cozy, semi-private area to relax. A wrought iron hanging basket stand can be a functional, decorative front porch accessory. There's something warm and welcoming about a colorful flower in a vintage plant stand gracing the entrance to a home. Many living situations today only have a deck or balcony as their exterior space. Wrought iron posts that can be attached to the deck are an ideal way to enjoy plants and flowers in what could otherwise be a visually uninteresting space. A metal plant stand with shelves or a tiered basket stand would offer a space-conscious place for flowers on a balcony. When the weather is warm and beautiful, it's rewarding to respond to that gentle tug towards the outdoors. It's more tempting to make time for outdoor relaxation when there's a location or a piece of furniture that is irresistibly enticing just sitting there waiting to be enjoyed. Comfort is the goal when relaxation is the desire. Warm days provide an opportunity to spend time outside enjoying what would ordinarily be indoor activities. A perfect example of such an activity is story time with the kids. The ez hammock chair provides an ideal location for story time. Kids can crawl into the chair and settle down to read or be read to. This chair provides an ideal setting for a parent and child to read together or for siblings to read to each other. There's even room for the family pet to share this quality time with its special family members. Warm evenings or evenings with a slight chill in the air provide the ideal setting for a cozy, intimate evening. The ez hammock chair is designed to accommodate two people comfortably. A super comfy head rest and a padded footrest for each person adds a luxuriousness to the chair. Its exquisite design makes it look like a chair that would be found at a high-end luxury resort. Extra details such as the two cup holders are amenities designed to increase the level of convenience this chair offers. A lot of attention is being given to the trend of stay-cations. With this chair, any outdoor space can be transformed into a vacation-like oasis where a couple or a family can enjoy its uniqueness, comfort and beauty. It is a place where relaxing comes easy, naps are encouraged and a strengthening of family bonds is likely to occur. This chair features a design that is easy on the eyes and can enhance any outdoor space. Time outside can take on an entirely new meaning with this chair hanging around waiting for someone to sit down and experience the relaxation and soothing comfort it offers. A water retention mat can be extremely handy for people who are passionate about gardening. It can often make the entire gardening process markedly easier, after all. A good moisture retention mat can ensure that dirt remains nice and moist for a significantly longer period of time. This, in turn, enables gardeners to water their plants a little less frequently, maximizing convenience and saving precious time. This type of protection mat can also be highly effective for offering top-notch insulation and retaining water. People who enjoy container gardening often rely on these handy protection mats. Some people enhance their container gardening methods by using little sections of these mats on the lower portions of their pots or planters. Since these liners don't soak up water very quickly, they often make the watering process more successful. When gardeners water their plants, moisture remains close to the roots for some more time. Once the liners actually do take in the water, any extra simply empties out. This can introduce a wonderful distribution of both oxygen and water. Gardeners who would like to maximize the well-being of their vines, flowers and herbs might greatly appreciate moisture retention mats. Individuals who are diligently looking to find plant liners might want to explore their options in these kinds of mats. Many people rely on them for their wrought iron items. When it comes to purchasing a moisture retention mat, sturdiness and strength are key. The right moisture retention mat can stay strong and effective for years at a time. Since constantly getting new liners can get pricey and annoying, durability is an extremely important factor to consider. A water retention mat can make a helpful addition to any gardener's assortment of tools. Not only can these mats be useful for offering insulation and keeping water, but they can also be useful for holding on to key nutrients -- a serious plus. I am 60 years old. When my mother was 60 I thought she was old. When my Grandmothers were 60 I really thought they were old. I guess you never think it will happen to you and when it does you just don't believe it. Maybe it is because everything around me is ancient. Take a look a my two story brick smokehouse that is behind my home. Built in 1848 to process the family's meat by building a fire in the fireplace to smoke the meat. Recently I added wrought iron shutters. I was taking pictures of these shutters to sell on my web site A Rustic Garden and I couldn't take them down. Granted they are a little fancy for my old brick smokehouse but I like mixing styles. I am going to keep them for me. Okay back to being old... I guess being old is relative to what you are comparing it to. Finding the right type of seating to use outside a home or business is often difficult. Individuals searching for the best seating options for porches, lawns or patios want something that is beautiful and durable. Flimsy outdoor furniture will not last long and is often unattractive. 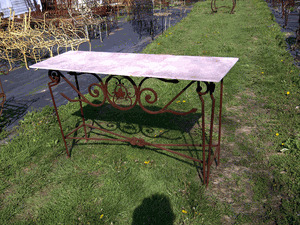 A fantastic piece of furniture to provide a classic look outside a business or home is a wrought iron fan back bench. Durable metal furniture is less likely to blow away in rough weather conditions such as rainstorms but lightweight enough to move around to make new seating arrangements for parties. Wood furniture tends to rot away due to moisture or become infested with insects. Cheap plastic outdoor furniture breaks quickly, leading to needing constant replacements. Metallic furniture has a long history because it lasts for generations while never going out of style. When someone invests in furniture, the items should last a lifetime, instead of just a few months. Selecting a quality piece of furniture for outside use leads to being able to change it occasionally by applying a coat of paint or adding embellishments such as cushions. A homeowner or property manager would never consider placing unattractive plastic webbing chairs inside a home, but gorgeous metallic furniture is easy to adapt for use in the home. A small piece of metal furniture looks perfect sitting in a building’s entrance-way or living room throughout the winter months. 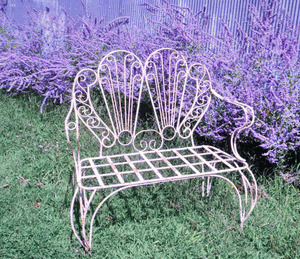 When selecting outdoor furniture, choose a wrought iron fan back bench. The high back of a bench provides a comfortable place to relax while sitting in the shade under a tree. Alternatively, this piece of furniture is perfect to create the ambiance of an English country garden when it is surrounded by beautiful flowers and shrubs. Of course, this outdoor seating is also suitable for placing on a wooden deck outside a large home or a balcony on a small apartment. Anyplace with a swimming pool also needs durable metal seating that is simple to rearrange for weekend barbecues with family and friends. A distinctive decorative element that can be added to any home, garden or property is wrought iron fencing. This type of fencing can be ornamental and functional at the same time. It is also durable and easy to install. 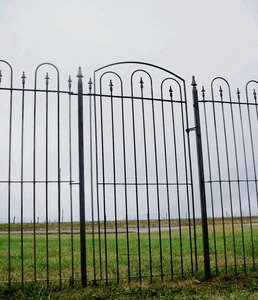 There are several ways wrought iron fencing can be used around a property. A wrought iron fence is a good way to help protect a property from intruders. The fence is an elegant solution over other options. Most criminals who want to come onto a property to try to rob a house or vandalize the area will simply skip a home with some type of barrier. Wrought iron fencing provides this barrier without hiding the landscape or blocking the view like solid wooden fences. Wrought iron fencing can increase safety for children and pets on the property. The fencing can be placed around a pool, a pond or another water feature that presents a risk to small children and pets. With 6' tall wrought iron fencing, kids and pets will not be able to scale the barrier or slip between the posts. The fencing will not interfere with the overall look of the yard or garden. It is also much easier to maintain than wooden fences. Wrought iron fencing can be used in a garden or landscape as a unique type of trellis. The fencing can be used to create wide panels for vines. They can be used to create circles or boxes in a garden to contain special plantings. An added benefit is that a wrought iron fence used as a trellis can provide privacy on the property. It can make a quiet and peaceful area once vines have filled the spaces between the posts. A final use for wrought iron fencing is as a unique accent along the property line. The traditional options today have little character and tend to become less attractive over time. Placing 6' tall wrought iron fencing around a property provides a classic look that can accent the landscape and any type of home architecture. The fencing will not degrade or change over the years. The rustic garden table is a popular find in many backyards. This style features simpler designs that usually favor earthy colors and nature-inspired patterns. There are many models available, ranging from elegant to practical. While individual models may look different, each offers similar functionality that can turn a plain backyard into an extension of a home. A backyard table is a great place to enjoy quality time with friends and family. This space can be used for many group activities. Bring everyone outside and work on a craft together or enjoy game night in the open air by hosting it on the patio instead of in the kitchen or living room. Outdoor tables are also ideal for meals and social gatherings like birthday parties, reunions and holiday events. The look can be changed to match a certain theme or color scheme by adding a table covering and party decor. Tables can also be pulled to the side of the outdoor party area to use for food and libations so guests can remain outside without going in for refills. Telecommuting, or working from home, has become very popular in recent years. It’s nice to not have to go into the office but even a room inside a house can start to feel stifling. Use a table in your backyard to create an outdoor workspace when the weather permits. While being productive, workers can also get plenty of sun and fresh air which can make going back inside after work much more relaxing. Taking photos can be fun, especially when the right setting is available to do it. A wood or metal patio table offers a flat, even surface that can be used to take pictures of objects, pets and people. Smaller tables can be moved to different areas around the yard for shots that include fences, flowers, shrubs and other outdoor features. The rustic garden table is one of the most versatile outdoor accessories available. Quality models are constructed with durable materials so they last for years, making the initial investment well worth the cost of the table. Ladders that are wooden have served a functional purpose throughout history. Crafted from strong, durable wood, they can last for an indefinite period of time. In addition to serving the necessary function of allowing people to reach high spaces, with a little creativity, they've also been transformed into a variety of household decor items. One unique D.I.Y. idea to employ ladders made from wood is to use them as a coat rack. By securing the ladder to the wall in a horizontal position, it becomes easy, stylish storage for coats and sweaters that is functional while giving any room a rustic vibe. Additionally, leaning a wooden ladder against a wall, securing with nails and adding shelves creates a unique, nautical-style bookshelf. Adorn it with seashells, ribbon or lace to customize it to align with any decor style. Avid crafters and quilters alike will appreciate the versatility of using a wooden ladder as a display for their creative efforts. Utilizing the same technique described above, secure a ladder against a wall in a leaning position and drape quilts, embroidery or needle-work over the rungs. For added customization, sand and paint in a desired color. Bathrooms are, by nature, some of the smallest rooms in a home. To incorporate towel storage that is both functional and interesting, attach a wooden ladder to the wall in a flat, secure position, leaving enough space to drape towels over each rung. If you'd prefer to only have a few rungs for storage, this can easily be done by removing the unneeded rungs and sanding down the edges. To clear up some cabinet space in the kitchen, install a wooden ladder horizontally from the ceiling, hanging at the desired height. Using S-hooks, secure pots and pans from the ladder for an easy-to-reach alternative to those pesky cabinet pan piles. With the right tools and a bit of creativity, this common household item can be transformed into a variety of functional pieces with endless creative possibilities.